These Sidewalk Signs Securely Hold Graphics! These Sidewalk Signs are Portable Signs that Increase Sales! Buy Wholesale Signs Online Now! Sidewalk signs are designed specifically for outdoor use. A rugged plastic construction assures these yard signs will never rust or splinter. Each sidewalk sign includes two outrigger feet, able to be filled with water or sand for supplemental stability. These yard signs have molded-in tie down holes that enable the unit to be chained or wired to deter theft. This message board has all characteristics you could possibly need in an outdoor signage product, yet it is sold at an affordable price! 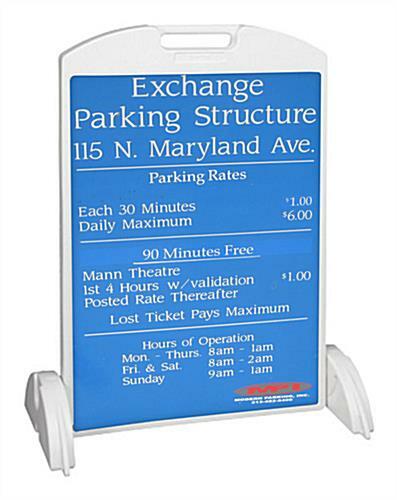 These sidewalk signs are perfect for print shops or buyers who have Coroplast® signs or other sign blanks ready to insert. These advertising message boards, sidewalk signs are double-sided, ensuring clients view your media content from two directions! Coroplast® signs, Sintra® boards or other rigid sign materials may be exhibited in this message board. These sidewalk signs also incorporate an effortless, slide-in design for inserting sign blanks. Please Note: This outdoor signage is the sign frame only. 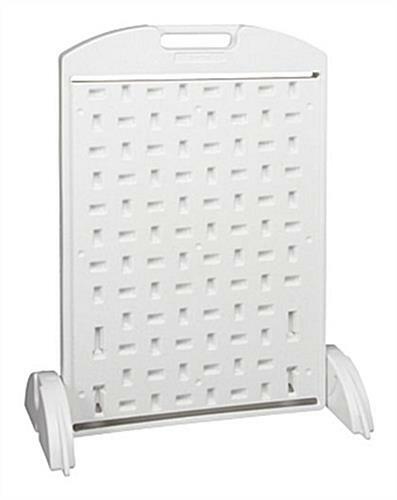 It does not come with any board, coroplast or lenses. This "raw" unit is ideally suited for print shops or companies that have the ability to make their own signs on 1/8" coroplast. 30.5" x 40.8" x 16.9"